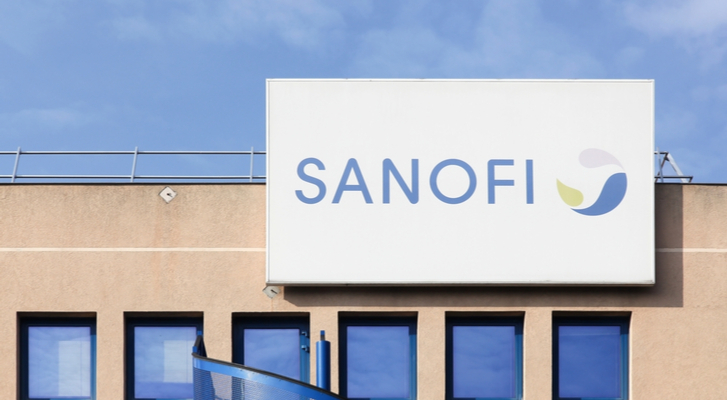 Paris-based Sanofi (NYSE:SNY) beat analyst estimates in its earnings for Q2. This company has seen declining income over the last few years. Many of its drugs have seen significant drops in revenue, and others face patent expirations. Now, with new drugs coming into the market, SNY stock could be poised for a recovery. The company reported earnings of €1.25-per-share ($1.47-per-share). This beat analyst expectations by three euro cents (3.5 cents). However, revenues came in at €8.18 billion ($9.6 billion). This missed Wall Street estimates by €90 million ($105.66 million). The company also saw revenues fall 5.8% from year-ago levels. The SNY stock price rose modestly in early morning trading following the announcement. Net sales actually rose by 0.1%, but changes in exchange rates led to the lowering of revenue. Its second-largest division, Specialty Care, saw the highest rate of sales increases. This division saw 29.5% higher sales. The lowest performing division, Vaccines, fell by 15.7%. However, Vaccines have become its second-smallest division, making up about 10% of overall sales. In the previous quarter, most of the focus fell on its third-largest division, Diabetes and Cardiovascular. Indeed, sales in this division dropped by 9.4%. Diabetes and Cardiovascular constitutes slightly more than 18% of total sales. The 20.6% drop in sales for its diabetes drug Lantus drove much of the decline as it makes up over 65% of sales in this category. However, the second-most popular drug in the division, Toujeo, saw sales move higher by 7.9%. Despite the lackluster quarter, analysts expect improvement in the coming years as new drugs from the pipeline show promise. Like peers such as Pfizer (NYSE:PFE) or Merck (NYSE:MRK), pipelines remain vital to future growth. Initial sales of Dupixent, an immunology drug developed in collaboration with Regeneron (NASDAQ:REGN) rose to €126 million ($147.9 million), up from €26 million ($30.5 million) in the same quarter last year. The company also saw a massive increase in sales with its cardiovascular drug, Praluent, another Regeneron collaboration approved in 2015. Sales rose by 54.8% to €62 million ($72.8 million). As a result, most expect income growth to improve. After seeing net income fall by an average of 4.73%-per-year over the last five years, Wall Street sees a turnaround coming. They forecast a 5.1% growth rate for this year and an 8.2% rate for next year. This will lead to an average growth rate of 6.7%-per-year over the next five years. With net income expected to come in at $3.28-per-share, this takes the forward price-to-earnings ratio to just above 13. The average P/E over the last five years has stood at 24.65. The last time the P/E held at current levels for any length of time was the 2009-10 timeframe. SNY stock could also find itself in a position for a comeback. The stock reached a high of $57.42-per-share in September 2014. Today, it trades about 25% below that high. However, the low P/E ratio and the return to growth could position this stock to climb out of its bear market. Investors will also collect a substantial return while they wait. Although its dividend fluctuates, today it stands at the equivalent of $1.86-per-share. This takes the dividend yield to 4.33%, more than double S&P 500 averages. Although earnings offered a mixed picture, management presented a bright future for SNY stock due to sales of new drugs. While sales rose slightly, currency fluctuations took revenue down. Despite lower revenue, new drugs such as Dupixent and Praluent show promise in reviving revenue growth. Valuations have also reached lower-than-average levels. The low P/E, the higher projected growth coming from new drugs and the dividend all work in favor of SNY stock. Such conditions could take the stock back to its 2014 highs and beyond. Article printed from InvestorPlace Media, https://investorplace.com/2018/07/why-sanofi-sny-stock-should-run-higher-despite-mixed-earnings/.